This image is located in the Pisces constellation and covers an area about 170 times smaller than that of the full moon. More caption details below. In research published in The Astrophysical Journal Letters, the Brightest of Reionising Galaxies (BoRG) survey team found one galaxy was a bright source seen more than 13 billion years ago, as expected. But the other was an “impostor” – a relatively nearby galaxy mistaken for one very far away due to its red colour. The researchers said this discovery - that the brightest known galaxy candidate in the early universe is essentially a fraud - has profound implications for models of how galaxies formed when the universe was in its infancy. BoRG is designed to find bright early galaxies. The BoRG project, led by Associate Professor Michele Trenti from the University of Melbourne and the ARC Centre of Excellence for All Sky Astrophysics, exploits Hubble’s ability to use multiple cameras at once. “Since Hubble primary time is so scarce and oversubscribed, the BoRG survey represents an ideal opportunity to carry out cutting-edge science at no extra cost,” Associate Professor Trenti said. The two galaxies in this study were first observed as part of the BoRG survey and published in 2016 in a paper led by Dr Valentina Calvi of Baltimore’s Space Telescope Science Institute. The latest study used Hubble to look again at those sources in order to take a more detailed measurement of the two galaxies’ colours, thus refining their estimated distances. One was from more than 13 billion years ago, when the universe was only five per cent of its current age. University of Melbourne astrophysicist Rachael Livermore, who lead the research following up BoRG’s discovery, said this galaxy was incredibly bright compared to its peers. “This makes it a perfect target for further study, so that we can really understand what's going on inside galaxies way back in the early years of the universe," Dr Livermore said. "Looking really far away basically allows us to take baby pictures of galaxies, so we can see how they started and then figure out how they grew into the types of galaxies we see today,” Dr Livermore said. “Now that we have a better measurement of the colours, it now looks as though the brightest galaxy is actually relatively nearby – we see it only nine billion years back in time, whereas it was previously thought to be 13 billion." These galaxies are a natural target for Hubble’s successor, the James Webb Space Telescope, which is due to launch in 2021. The new telescope is designed to find and characterise very early galaxies and the BoRG team hopes to use it for further research. The latest study is published in The Astrophysical Journal Letters and was partially supported by the ARC Centre of Excellence for All Sky Astrophysics in 3 Dimensions (ASTRO 3D), a $40m Research Centre of Excellence funded by the Australian Research Council (ARC) and six collaborating Australian universities: The Australian National University, The University of Sydney, The University of Melbourne, Swinburne University of Technology, The University of Western Australia and Curtin University. Based on observations made with the NASA/ESA Hubble Space Telescope associated to programs #14701 and #13767. Image credit: R Livermore (University of Melbourne), M Trenti (University of Melbourne), and the BoRG team. Based on data taken with the NASA/ESA Hubble Space Telescope. 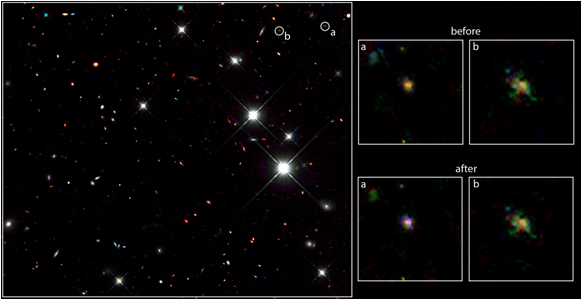 The colour composite image on the left is taken in near-infrared light and shows the location of the two candidate galaxies initially thought to be at a distance of more than 13.2 billion light-years from Earth. The close-up images on the right show a zoom-in of the two galaxies. The top row uses data from the initial discovery, while the bottom row shows the colours using additional, more precise observations. The powerful Wide Field Camera 3 on board NASA/ESA's Hubble Space Telescope initially discovered the two galaxies in a random-pointing survey called BoRG (Brightest of Reionizing Galaxies Survey). This image is located in the Pisces constellation and covers an area about 170 times smaller than that of the full moon. Follow-up observations with the same camera refined the near-infrared colours, clearly identifying galaxy "a" as an impostor that is only about 9 billion light years away rather than 13, while galaxy "b" colours, and hence its distance, have been confirmed by the new observations. Galaxy "b" is observed when the Universe was about 600 million years old, and it emits more light than the Milky Way, our own galaxy, while probably containing about a tenth of the stars.